Entrepreneurial Endeavor – Get your Gear NOW! The apparel line came about over conversation in Archetype Dermigraphic’s Tattoo Studio. It was a chat between shop Owner, Ben Shaw, and friends, Raiden Ruiz and UFC star Diego Sanchez. It was a special “shop talk.” UFC fanatic Isaac Marquez sat just a few feet away, getting a UFC tattoo and Raiden Ruiz was filming it all. These men, never stop working – this day was no different, except that something NEW was born. 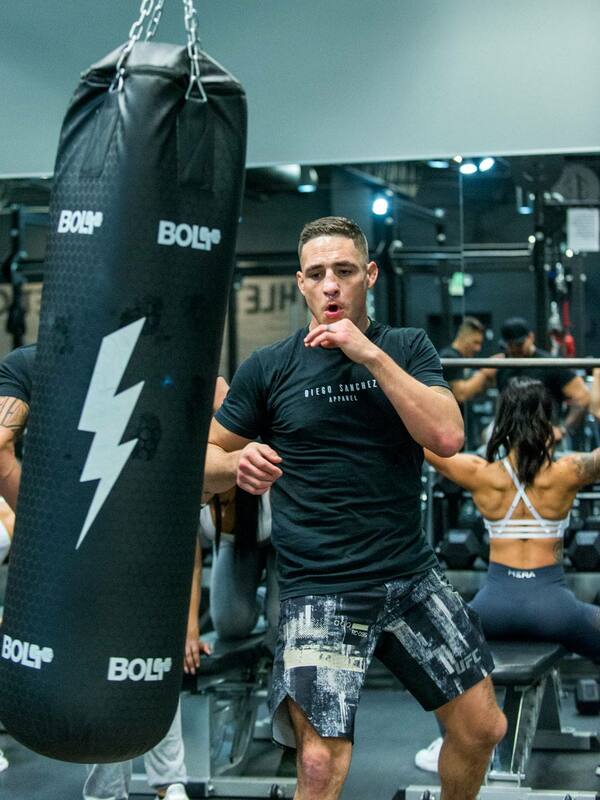 Diego Sanchez made that day, the day he committed to launching “Diego Sanchez Products” apparel. Shaw created the perfect logo and Raiden and Diego designed shirts for the baseline foundation of the company. Now it’s available to you! Consumers far and wide – UFC fans around the world, will soon be able to rock some Sanchez specific threads! They are keeping things simple, comfortable while focusing on quality and consistency – easy to glean from a tattoo shop owner, a financial advisor, and a UFC champ, right? Diego Sanchez Products also includes an available stock of CBD products and is pushed along by a series of YouTube videos that the trio is producing that aim to educate youth about the power of collaboration and entrepreneurial thinking. They’ve been working together since March and this is just the tip of the iceberg in terms of what’s available from this business trio. For now, you can visit: www.diegosanchezproducts.com go get your gear! And if you’ve got questions, direct them to Raiden at raiden_ruiz@yahoo.com – The future it brings for these Burque boys. It’s time to get to work. “We’re staying as community-driven as possible. 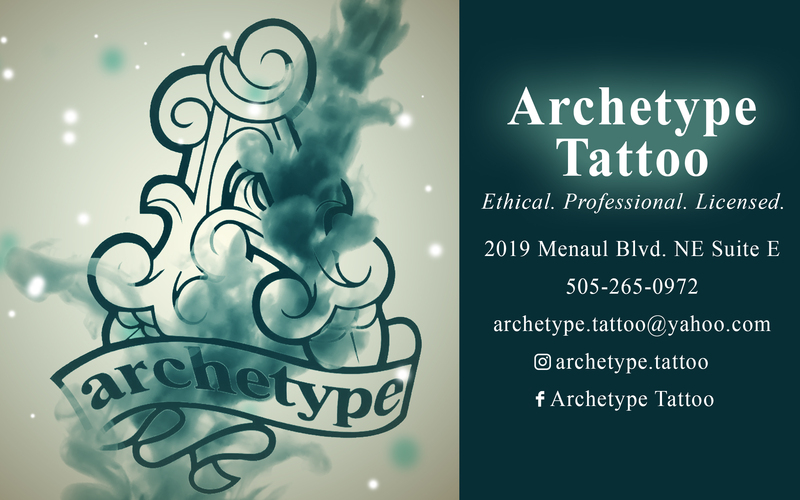 We have an upcoming event at Ponderosa Brewing Company on April 26 at 7 pm where we do a little something called Art Fusion,” said Ben Shaw, Owner of Archetype Tattoo, a local shop that lends to the community on a regular basis. Art Fusion for a Cause is a charity event benefiting different charity organizations around New Mexico. Four artists combine their talents on 4 separate canvases, switching off on each other’s work until the four pieces are complete. The artwork is then raffled off and 100% of the proceeds go to the charity of the evening. Aside from using their craft to benefit the community, Archetype artists continually hone their craft every chance they get. “A few of our artists will be attending the Explorer Tattoo Conference this May in St. Louis, MO, to gain some new knowledge and technique to create even better tattoos,” says Shaw. His excitement for delivering the best of everything to those of Albuquerque is palpable and contagious. The shop is filled with talented and enthusiastic artists who create an atmosphere unlike any other in the Duke City. One of the things that Shaw and company are most excited about, is the 9th annual New Mexico Tattoo Fiesta at Isleta Hotel and Casino. The event is n July 12, 13, &14 – and Archetype is an official sponsor. Part of building a brand has come into play as Shaw and his team moved locations last year. “We worked hard to establish our new(ish) location and prove we are some of the best in our community. The shop and our artists took a bunch of awards from the Alibi, Albuquerque Journal, and Albuquerque the Magazine,” he mentioned proudly. Archetype is definitely a family. They lift each other up and support each other in and out of the shop. “We have some of the most talented, diverse, and adaptable tattooists working in our shop,” he said. Aldo has the wackiest, most creative mind – and the technical talent to back it all up. Want an original, quality sleeve done in a day? Just ask Carlos. Eddie’s the man for black, gray, and all kinds of ill sh*t – and just the man to make you comfortable for your first tattoo. Meghan’s sweet neotraditional style coupled with her incredible customer service skills make Archetype one special place to be tattooed. It’s definitely obvious that Archetype artists know their craft. All their artists are 100% licensed, meaning they have completed over 1000 hours of study in the art of tattoo and have certifications in blood borne pathogen training, CPR, and first aid. This is definitely a safe place to add to a collection of body art – or to get your first. Shaw’s artists know their stuff – and they are driven to keep learning new techniques by attending educationals and conferences specifically for tattooing. Already an award-winning they continue to keep getting better Burque’s ink junkies. If you’re looking for a new piece, look no further – and if you’re just looking for a neat group of folks who go above and beyond for their community – catch em at Art Fusion, or the New Mexico Tattoo Fiesta. Tell em thanks for all that they do for this city of ours. Young people in our communities around New Mexico, deserve the very best. Nobody believes that more, perhaps, than Frank Magourilos of Prevention Works. Frank runs a company doing digital and print outreach and messaging, and has partnered on several occasions via JohnyBoards services, to make sure his message is read and seen far and wide. Frank does work in several counties around New Mexico, his work as the Be Above the Influence campaign with Bernalillo County is just one example of him going above and beyond. As we strive to make their experiences safe, and fruitful, it takes a number of strategies and efforts to keep them out of harm’s way. Prevention Works realizes this and has taken the lead in messaging to those young people, meeting them where they are at so to speak – with their Above the Influence Campaign. Above the Influence has truly gone above and beyond in their efforts and with their reach. They exist in ALL public, private, and Catholic schools in Bernalillo County. With community centers, libraries systems and more – they are partnered with over 300 entities in Bernalillo County; it’s plain to see and admirable that this work is not being taken lightly, but instead being met with the focus and energy it deserves. Living “above” things can be hard for our young people. In the era of social media, where our lives are lived on a screen, things can be hard to get “above,” especially for our young ones. This is why they need all the help they can get. Want to be involved? 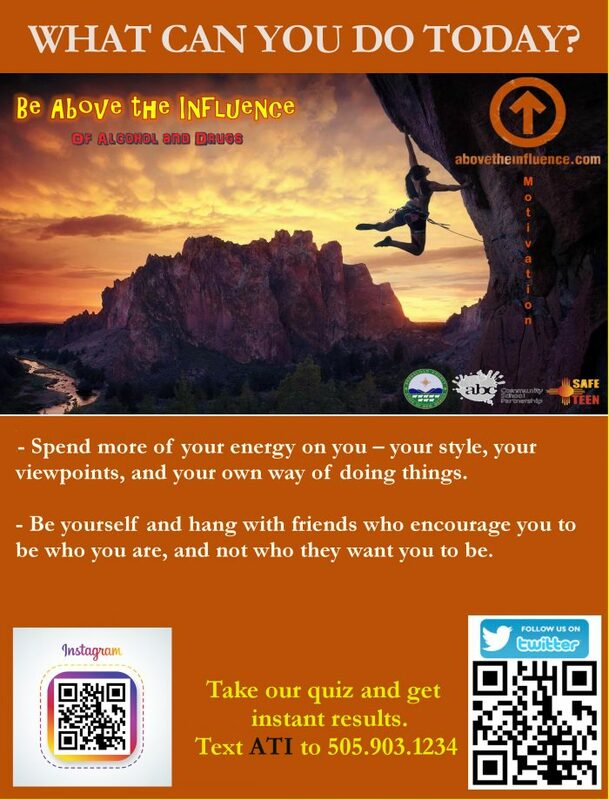 Above the Influence is always looking to add more partners to the Be Above the Influence Campaign. When you see the ad up on a JohnnyBoard near you, consider getting involved – you won’t be disappointed! Hey, Albuquerque. Being the wonderfully creative, entrepreneurial driven city you are – we wanted to take a second to see if you’ve heard of one of the gems that the Duke City has to offer – FUSE Makerspace. Heard of it? We had a moment recently to talk to Britney King of FUSE – an employee who has been in place for over 3.5 years – working to make life for makers, and business to business opportunities a reality, in Burque since she got on board. Speaking of “getting on board,” FUSE and JohnnyBoards have a symbiotic relationship of sorts. 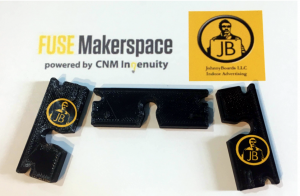 Being that FUSE specializes in a number of things, one of which is 3D printing capabilities, it was a good fit for Ruben Garcia and the JohnnyBoards team, to team up with Ms. King and make things happen in a small business to business fashion between the two outfits. CNM and JohnnyBoards identified a need and an opportunity to use each other’s expertise to model business to business benefits in the Duke City, when they agreed to develop a prototype that they put into action by way of the creation of security clips for the advertising boards you see in common areas around town. Garcia and King, modeled a clip, and then modeled behavior they’d like to see replicated by agreeing to #BuyLocal and support each other’s efforts vendor to buyer and vice versa. Great right? Worth supporting, right? So next time you see a board in a bathroom or elsewhere, take a closer look at how they’re constructed, and see the value and example of businesses working together in Burque. Choose to work with either of them the next time you have an opportunity to do so as well. Below you’ll find a list and descriptions of services that FUSE can provide to you – and here is a link to vendors that JohnnyBoards works with and through – find a fit for you, and get in where you fit in. Enjoy. The FUSE Makerspace is a community center with tools that allow members to design, prototype, and create manufactured works. Great right? All you need is some cash, creativity, and time and you can use FUSE as your launching pad for the next big idea in that brain of yours. FUSE is aided in the work it does in the Albuquerque community thanks to a partnership with CNM. Partnering with CNM, allows FUSE to give their members access to affordable, high-quality classes as well as mentoring from other makers and community members. FUSE is hard at work fostering the startup spirit in Albuquerque’s Innovation District by creating jobs and supporting businesses in the downtown community. They are enthusiastically invested in stimulating creative thinking and economic growth in Albuquerque and the surrounding areas. A safe, professional facility for manufacturing your ideas. Equipment and tools for precision and large-scale projects. Offices for rent to foster the development of your small business. A collaborative, creative working environment. FUSE operates both on a membership and workshop based basis with prices that vary depending what your interest and engagement are. We asked them to run down the details as much as possible, and they provided this quick reference to some of their services and prices. When you think of Albuquerque, you think of balloons and chile – you might think of Breaking Bad and sunsets – movie sets and now, Netflix. But, you might not think about a thing, a family, and a business that has been here for all of that – and in many cases longer than everything but the chile – that business is Model Shoe Shine. Model Shoe Shine has been around for 87 years. Yes, you read that right, 87 years. We asked, now owner, Adam Campos to tell us about how it got started. “It was started in 1931 by Bill Cheers, in 1989 my uncle Rick Campos took over and my dad Chuck Campos and I, Adam Campos took over in 2000,” he said. The downtown tiny shop is a well-known spot for the whos who of ABQ. Politicians, business owners, and your regular joes, all get their shine on, downtown. Downtown is seemingly a great location for such an outfit – and Campos is hopeful about the neighborhood. When we asked him about his feelings for the area and the future of the city, Adam said, “It’s getting better with the new mayor adding more police Downtown. I feel safer and my clients feel safer.” Exciting right? Commitment and perseverance are obvious traits of Adam’s and it takes folks like him and businesses like this to make sure we stay the course of cleaning up more than shoes on Gold Street. Speaking of shoes, just for fun, we asked Adam to share one of the most obscure requests that Model Shoe Shine has received and fulfilled. “We had a guy that had boots with some type of fur and we gave his boots a haircut. weird but he was happy,” he said with a chuckle. Haircut ah? Well, it’s not that far off for a gentlemen’s shop. We should make the point known though, that it’s not just a shop for men… They cater to everyone. Services range and vary as do prices; our standard shine is just a “five” – with a tip appreciated of course – but the buck doesn’t stop there. Adam offers a number of other things including shoe shine, shoe repair, drop off and pick up, die and conditioning of leather, purses, and handbags. So the next time you’re hanging around downtown, stop in and say hi. Make sure it’s before five. 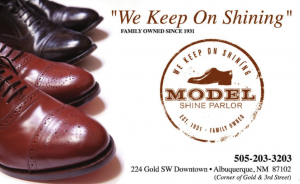 Model Shoe Shine is open and ready for your business Monday through Friday 8:30-4:30. Support an amazing local business and hit the street with fancy feet. Tell Adam hello from JohnnyBoards. Cheers. The New Mexico Poison and Drug Information Center has been a program at the University of New Mexico College of Pharmacy since 1977. No new kid on the block here – but this long-standing community program and staple, is helping kids in the greater Albuquerque community, who are focused on helping themselves and the world around them. Recently, the NMPDIC, which focuses primarily on poison prevention and professional education throughout the state and two phone services: poison help (for questions about and management for poisonings) and drug information (any questions about medications), chose to focus on a different kind of impact. They chose to purchase advertising from JohnnyBoards. JohnnyBoards is an “unavoidable” advertising company that aims to hang advertisements and information based postings in common public areas – this has been key in places like APS schools because these days, the majority of information and postings that are “dropped off” at schools, ultimately doesn’t get distributed, but recycled at best. Why is that important? The money that they spent on the ads, $500 total to be exact, was passed directly through and to, students/members of the DECA program at Highland High School. DECA programs exist around the nation. They’re membership-based programs that allow young people in a high school setting to gain experience in entrepreneurial endeavors in the realm of marketing, business management, hospitality and finance. It only seems fitting then, that JohnnyBoards, while speaking to local community members who were also connected to Highland High, and the DECA program, and finding out that their program needed support for means of fundraising to attend a national conference, JohnnyBoards chose to help in an innovative way. 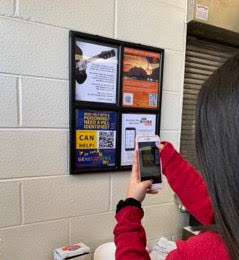 The advertisement that primarily focuses on prevention and education based messaging on JohnnyBoards frames in and around common areas at Highland High, is being sold to community stakeholders that believe in the power of Albuquerque youth and supporting their dreams beyond the classroom. Sound like something you and your business would be interested in? Contact Ruben Garcia of JohnnyBoards TODAY! As you can see, anyone can find a way to send their message, advertise and promote their service, and with a little bit of community-minded thought power, benefit something and someone beyond themselves. Cheers NMPDIC and JohnnyBoards – let’s hope it starts a trend. FOUR YEARS IN AND READY FOR MORE! EATON MEDIA IS HERE TO SERVE YOU! After taking a boot camp at Deep Dive Coding, Kirsten Eaton and Eaton Media took off. Eaton has been working in the “media space” for over four years now. Functioning as a service provider to JohnnyBoards and beyond – Eaton Media’s services include but are not limited to, the creation of websites and additional accompanying pages, management of social media for various clients in different sectors, and blog posting to keep things fresh. “I appreciate working and collaborating with ABQ’s businesses. We all are bringing a wide range of services to each other and help one another to learn and grow and strive.” We can appreciate that – how about you? Eaton Media seems to have it right, approach-wise, in terms of building an ecosystem here in Albuquerque that allows businesses small and large to benefit from knowing each other and aiming to do business with one another. Social Media Management – $350/mo Social Media includes; Newsletter Marketing, flyers. Website Management and Updates – with website creation ranging from $750 to $2500. As you can see they can do it all – and they go big, but Kirsten made it a point to point out that their specialty is actually in the details as well, with an emphasis in graphic design, Eaton Media specializes in flier creation, for events all over the map. Their client base is wide spanning too, with a foot in the brewing industry, advertising industry and more – some Eaton Media clients include Nexus Brewery, The 377 Brewery, imbibe, and of course JohnnyBoards. Like the sound of all this? Get on board! With four years worth of work under their belt, the team at Eaton Media is ripe and ready for more. If you need help managing things beyond yourself – those things in the digital realm, get in touch with them, TODAY! Do you have a business that is aiming to improve your presence in the ever growing realm of digital media? Do you need branding help – someone to help with your digital marketing, a flashy new functional website, or graphic design in terms of things big or small? Well, 11online does it all. They’ve been doing their thing for over 4 years in Albuquerque, for businesses far and wide. We got some time with these busy media makers to talk about what it takes to take on jobs in the world of dot com – they had some great things to say, about who they are, what they do, and what they can do for you. From being what they would call an “agency advisor,” to handling all things tech support, and embedding their team within yours, this versatile business that operates with hours that fit your needs is definitely a team that you want on your team! 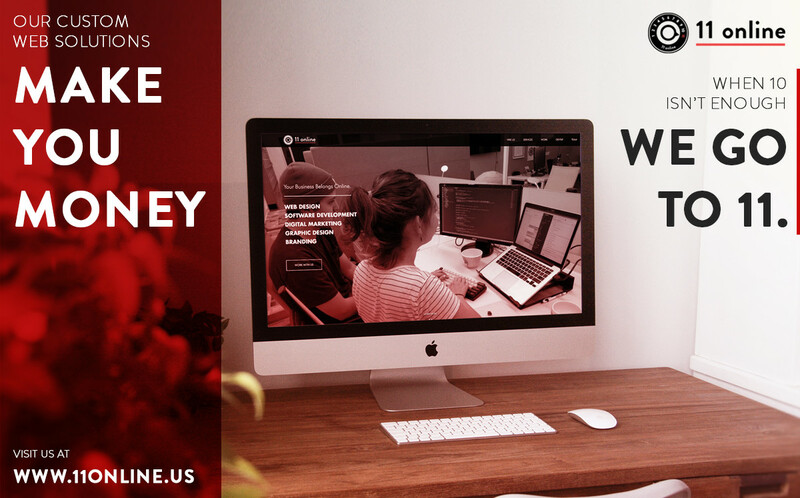 With jobs that have been in the 250k range, too small and get it done for a thousand dollar kind of projects – 11online sees the opportunity in doing businesses with any business that needs or wants to utilize their services to improve their digital presence and enlarge their footprint. 11online is located in downtown Albuquerque – and an area they particularly enjoy catering to and housing their business in, because of the walkability to local bars, restaurants and coffee shops – makes sense, since food and beverage businesses are some of these guys most interested clients. Some of their clients to date include: Holistic Management International, Triberr, CheckUp & Choices, Rainbow Ryders, and of course JohnnyBoards. 11online has worked with JohnnyBoards for years, having first met at a Deep Dive Coding boot camp, the two businesses synced up and have been helping each other do good business in the Duke City ever since. Want some help from a versatile and skilled local outfit? Look no further than this team – when 10 just isn’t enough, they take it to 11. Reach out and expand your reach. Bring in an expert to get the job done that you thought you had time for, and continually remind yourself that simply is not the case. Let 11online take the day to day business building off your plate so that you can focus on the real work, satisfying and delivering your product, experience, or brand to the public/consumer. The OneABQ app houses all the city’s applications in one easy-to-use app available for any Android or Apple device. 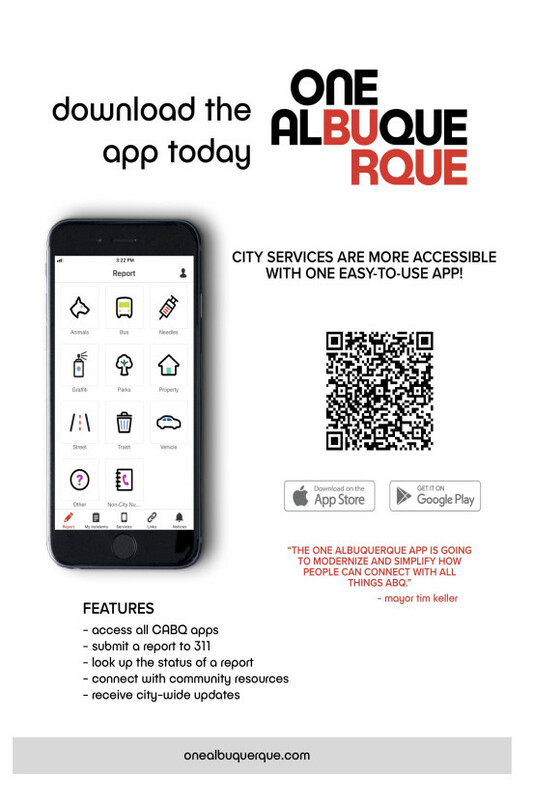 It allows users to report issues to 311, checks on the status of existing 311 reports, link to other mobile applications and receive important notifications from the City of Albuquerque. You can NOW download the app by scanning the QR code present on any One ABQ: APP ad at a JohnnyBoards location. This is another incredible step in innovation by the City to aid their efforts in keeping Albuquerque residents informed. Pretty neat, right? No long waits to report that graffiti across the street. If you have to figure out where your bus is, or are looking for something different to do – you can do that too! The One Albuquerque initiatives continue; this is an example of meeting Albuquerque residents and taxpayers more than halfway when it comes to delivering information and service. What are you waiting for? Download it, today! If you’ve got it already, take a second to tell a friend. There’s a goal of 100,000 users by year’s end – lofty? We think not – not when something is just this useful. #OneAlbuquerque – gotta love it. JohnnyBoards Advertising and Designated Drivers on Demand came up with quite the idea for a partnership lately. We’ve all heard of Uber and Lyft; but have you heard of Designated Drivers on Demand? Many of us know who Clear Channel is but I bet you don’t realize you DO know what JohnnyBoards is too! 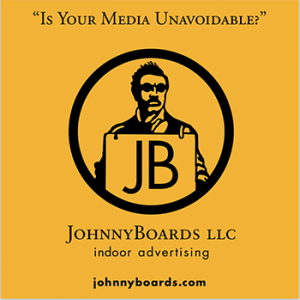 JohnnyBoards is a local in facility advertising business, whose signage is routinely seen in restrooms and public common areas above drinking fountains and otherwise in locally owned establishments. Designated Drivers on Demand is a locally owned ride home service for those Albuquerque residents who’ve had enough to drink on a night out on the town. The two have combined forces for the means of good – to impact and help lessen DWI in Albuquerque. That’s right! JohnnyBoards and Designated Drivers on Demand are 2 local companies teaming up to reduce DWI. They are asking or any bar, pub, and restaurant that serves alcohol to allow them to drop off coasters to remind customers to use Designated Drivers on Demand to get them or them and their car home. Neat idea right? Find a ride while enjoying a drink – because your drink is sitting on top of the advertisement – pretty smart. This pilot program will also have effects on other aspects of Albuquerque’s crime problem; it reduces overnight theft rings that target cars left in parking lots overnight and eliminates the hassle of going back the next day to get their car. Here’s how it works: Give JohnnyBoards and Designated Drivers on Demand your old/unused coasters and they will donate the coasters to nearby middle schools for art projects and a cash donation to help with wrap-around services such as bus passes, jackets and parent background checks so they may participate in student activities. As a trade, you will get the “ride offering” coasters in exchange, and everyone wins. This service is already operational in a number of local businesses – if you’re looking to get on the list, ready to help some kids, end DWI, and encourage responsible drinking, contact them today.